Internal EPA emails, released to the Natural Resources Defense Council under the Freedom of Information Act, offer more details on a grants review managed by John Konkus, a deputy public affairs chief and one of President Trump's political appointees. The documents show the review involved several appointees at times and often flagged EPA funds that were flowing to the Obama administration's allies and priorities, like combating climate change. Career officials at EPA also pushed back on decisions to pull funding from certain organizations. They also tried to make the case that agency money could be worked into the agenda of President Trump and Administrator Scott Pruitt. Steven Fine, acting chief information officer at EPA, even used one of Pruitt's buzzwords — "cooperative federalism" — when defending one grant that happened to mention the Clean Power Plan, the Obama-era rule to curb power plants' carbon emissions that Pruitt has sought to roll back. "The proposed work connects multiple types of information that are not related to CPP but are relevant to the interest of EPA and states," Fine said in one email. "The work unrelated to CPP is the vast majority of the proposed work and would support Agency and Administration goals related to clean air, clean water reliable energy production, and Cooperative Federalism," Fine added. Konkus was not convinced by Fine's argument. "This is not going to be funded and we would kindly ask you to alert the organization in the morning that the award will not be granted," he replied. But Konkus was later informed that the grant recipient in question had sent in a revised cover letter to better address its work. That sparked a softer response from him. "FYI this is how most grant discussions end up, the program and grantee work on a solution together to make the grant work better reflect the priorities of the Administration," he said in an email. The grants review attracted scrutiny after E&E News reported last August that Konkus, a political appointee, was overseeing the process, which had been typically managed by career officials (Greenwire, Aug. 17, 2017). An EPA spokesman told E&E News that the Trump administration wanted to be "good stewards" of taxpayer money. "EPA awards about $4 billion in grants annually, and the Trump EPA is committed to being good stewards of the taxpayers' huge investment in our agency by reviewing every grant award and solicitation," said the spokesman. EPA issued a memo on Aug. 8 last year directing its Office of Public Affairs to review and approve all grant solicitations. EPA's grants process, however, has changed again. The agency shared with E&E News an email sent last month, which rescinded the Aug. 8 memo. Instead, regional administrators and assistant administrators at EPA now have to approve "solicitation issuance" for grants. 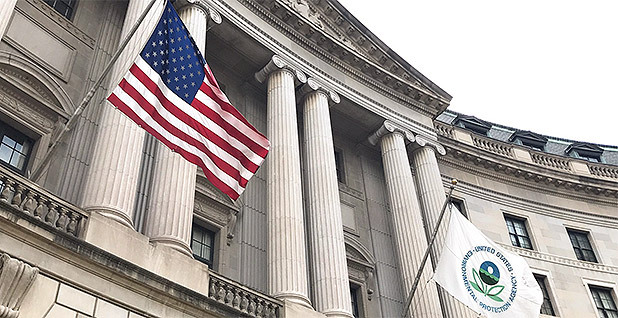 "Now that all of our Regional Administrators and most of our program AAs are in place, we have shifted the responsibility to these leaders to review and manage the grants that flow through their respective offices," said the EPA spokesman. Konkus' grants review may have begun even before the memo was issued last August. In an email to EPA Chief of Staff Ryan Jackson, the public affairs aide described marking a grant from earlier in the year. "This response is from July when I first flagged this grant," Konkus said. Several of the EPA emails show Konkus inquiring for more information about grants. In one, he asked if the agency had "a position on human testing." "See this proposed grant," Konkus said. In other messages, he prodded EPA to release funds to those who needed it most. "There are a lot of Puerto Rico grants in these files. I would love to get that money out to them!" Konkus said in one email sent last September after Hurricane Maria had devastated the U.S. island territory. Other Trump political appointees were asked to help with the grants review at EPA. Jackson said in an email, "I could use your help with grant solicitations," with several appointees copied on the message. "These need to be reviewed by OPA (John Konkus) before they go live," Jackson said. In replying to Jackson, Konkus noted that EPA program offices were using guidance that included "a reliance on the 2014-2018 strategic plan which was implemented by the past administration." Konkus sought other appointees' advice, as well. "These seem fine to me," Nancy Beck, the deputy assistant administrator in EPA's chemicals office, said in an email to Konkus, who also asked her to review a pesticide cooperative agreement. "No concerns from my end," said Mandy Gunasekara, a senior EPA adviser on air issues, when asked about certain grants in another email to Konkus. Konkus flagged several grants that included climate change in their descriptions or linked to environmental organizations. He even recommended some to be pulled back. In one list, he noted a grant obligated to NRDC to perform energy efficiency work, saying he and Gunasekara would "need a briefing on this one." The green group has been a staunch critic of the Trump administration. Konkus also said, "No to this please," on a grant for climate change research. Other grants for an integrated assessment of greenhouse gases as well as a study on air pollution meteorology and particulate matter also received a "No to this one please" message from Konkus. It's not clear from the email if their EPA funding was withdrawn in the end. At least one group has confirmed that its agency grant was rescinded. The Global Alliance for Clean Cookstoves, a public-private partnership launched in 2010 by then-Secretary of State Hillary Clinton, aims to reduce indoor air pollution. Its EPA grant would have been spent on a project intended in part to develop "an integrated and robust communications and outreach program," accompanied by biogas promotion activities, according to an EPA summary. "This grant should NOT move forward. Thank you," Konkus said in one email about the project. The actual amount of the rescinded grant is not clear. Kip Patrick, an Alliance spokesman, referred questions this morning to a statement issued last August by the organization expressing surprise at EPA's decision to rescind the money. "EPA's previous support of clean cooking has provided a model of how the U.S. can lead on innovative solutions to global issues in ways that have bipartisan support, that benefit Americans directly, and that help drive increased investment from the private sector and other partners," the statement said. In recent years, the Alliance, hosted by the U.N. Foundation, had received a total of $1.4 million in EPA money, along with more than $70 million in funding from other governments and the private sector, according to the statement. Winrock International, based in Little Rock, Ark., takes its name from the late Winthrop Rockefeller, a Republican who served as Arkansas' governor from 1967 to 1971. The nonprofit group's EPA grant was also geared to reducing indoor air pollution, according to the agency. "This grant should not move forward," Konkus said in an email about the funds. A Winrock spokesman did not immediately reply to emailed queries this morning to confirm the actual dollar amount of the grant and whether the funding was in fact withdrawn. When EPA funding was pulled from a group's grant, Konkus recommended that "a courtesy email or call" be made to them. "It does not have to be complicated, just a courtesy so that they hear from us first," he said in an email. Konkus did not respond this morning to a message left on his cellphone by E&E News seeking more information on his reasons for flagging the grants.